Aspiring writers often wonder how industry pros got where they are. The truth is, everyone’s story is different, but there are some common elements: dedication, persistence and hard work. Today we explore another aspect of the industry with a true advocate for writers, Laurie Scheer, a former vice president of programming for WE: Women’s Entertainment. She has worked as an assistant, d-girl, and producer for ABC, Viacom, Showtime, and AMC-Cablevision. 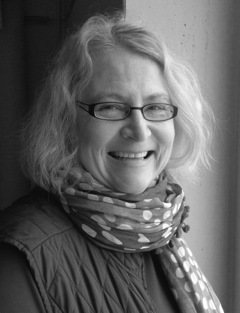 Laurie has been an instructor at universities across the U.S. from UCLA to Yale and is currently part of the faculty at UW-Madison’s Continuing Studies Writing Department, Director of their annual Writer’s Institute and Managing Editor of the The Midwest Prairie Review Journal. WHAT DREW YOU TO THIS INDUSTRY? I grew up in the Midwest. It’s very cold there. There’s not a lot to do there in the winter. I’m an only child and I just had a lot of time to myself. I loved watching episodic television and listening to music. It just dawned on me, I want to work in this industry. I want to be behind the scenes of a television show or behind the scenes of a music group or something like that. My first entry-level job was as an assistant to the Manager of Dramatic Development at ABC Entertainment in Century City. It was a secretary job. I got the job because I knew how to type. They had two jobs open, comedy development and dramatic development. I didn’t know what either one was. I just thought, you know, comedy that’s going to be really simple. Drama’s gonna be a lot more complicated. There’s going to be lots of character development. So I just went with drama. It didn’t pay much but it was absolutely wonderful and within 6 months on that job I learned more than I did in my 4 years of college. I stayed at ABC a couple years in that position and that sort of started that don’t stay at the same job for more than two years. You can move within a company, you can move to another company, but essentially the thought was don’t stay in the same job for two years. Start looking. So ABC at the time was opening up a movie division, ABC Motion Pictures, and they needed someone. Again an assistant, but it was a higher assistant in Marketing. So I went then to Marketing and I learned a lot about marketing and marketing of films, not television series. So already within my first three or four years I was starting to span between television and film and I started to realize that I have to hone this down. What am I going to do? Do I like television? Do I like film? That position lead then to a new pilot that was being made and I thought, “Oh I’ll try production.” And they gave me the job, which was very lovely because I had already proven myself. Many people wanted this job as a Production Assistant making next to nothing, 12 to 16 hour days, an unbelievable amount of work and I took it. That was on a show called Moonlighting, which was Bruce Willis and Cybill Shepherd and I lasted for 6 episodes. I did not like production at all. That was not for me, but I’m glad I did it because I learned a lot. Then I heard about a job at Viacom in story, back to development, story analyst. I was fortunate enough to get it and then that was 10 more years at Viacom. At that time Sumner Redstone had purchased Viacom, so we had been developing shows for NBC, for ABC, for the networks, but then because MTV, Showtime, Nickelodeon and VH1 were under the umbrella of Viacom, they came to us because we had been developing shows traditionally and those networks were not developing first run shows yet. So we started to look at a lot of content for those networks, in which I was so fortunate because I was developing things like Real World, Rugrats and Ren and Stimpy, just an amazing amount of stuff, a lot of Showtime shows and movies and also acquisitions. So that developed into learning a lot about cable and I moved up from story analyst to manager, Director of Development. One of the best pieces of advice was that I was feeling intimidated because I had come from the Midwest and here I was working in this Development Department with 4 or 5 extremely intelligent, at least to me they seemed very intelligent, very distinguished people. They had been already developing all these shows and here I am, I’m just sort of, I really don’t know what’s going on. And she was right. I had watched more television. I knew what was going on in the middle of the country. I knew how people really watched TV. They were in those offices already, sort of an ivory tower kind of thing where they had lost that reality. So the best advice was for her to shift that, for her to make me realize that yeah, I did know. In an unusual way, I definitely did know more than they did. And that helped. That gave me confidence. COMING FROM A BACKGROUND IN DEVELOPMENT, WHAT GENERAL ADVICE DO YOU HAVE FOR ASPIRING WRITERS? If you’re a writer you’re going to keep writing and so I encourage everyone, don’t give up. Get your voice out there. You’re going to resonate to someone. Coming Soon: Laurie shares insights from her years working with professional and aspiring writers. Laurie’s book The Writer’s Advantage: A Toolkit for Mastering Your Genre explores ways to preserve good storytelling within the 21st century transmedia marketplace and helps writers to prepare and develop their projects. Previous Previous post: Are You Ready for CARGO 3120?